Heat 4 tablespoons of olive oil in a saucepan, add the mixture to fry, brown it, add the ground beef and cook stirring for 5 minutes, add the tomatoes, season with salt and pepper and cook the sauce over low heat, covered, for another 30 minutes. In the meantime wash the heads of endive, cook for a couple of minutes in boiling salted water, blanch, refresh under cold running water and let drain, remove the root, then separate the leaves and pat dry gently with paper towel. 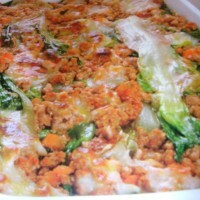 Grease a baking dish of 28×24, fill it with alternating layers of escarole and parmesan sauce until all the ingredients, go ila pan in the oven at 200 degrees for 20 minutes and serve.